When I was pregnant with Ben, to my surprise and to the surprise of everyone who knows me well, I had only one craving. Pancakes. I always thought that I would crave the obvious - pickles, ice cream, potato chips? But, no. All I wanted breakfast, lunch, and dinner were fluffy, drenched in syrup, pancakes. I ate so many pancakes that I'm almost certain that when the time comes, Ben won't be able to stand the sight of them. Poor kid was force fed pancakes in the womb for weeks on end. Every Saturday of my third trimester, while Ian posted up to watch soccer, I made us pancakes. I experimented with many recipes - banana, blueberry, chocolate, revisited my trusty favorite Brown Butter Greek Yogurt Pancakes and even made a pancake "cake" one time which was... let's just say, not to be repeated. The craving went so far that one time I even marched myself to the grocery store at 7:30AM on a Sunday, at 38 weeks pregnant, because we were out of eggs. No eggs, no pancakes. Three cheers for my ever patient husband for never denying my request to make him pancakes and silently working his way through stacks and stacks of flapjacks. For the record, he's not a huge pancake fan. Slowly, the weekend pancakes have turned into a tradition of making weekend breakfast. To turn things up a bit we've branched out - biscuits with bacon and eggs, frittatas, bagels, all the variants of breakfasty things. Pancakes make an appearance in the rotation, but not nearly as often. Because, let's be honest, whether out of a box or made from scratch - a pancake is a pancake. You can add all the bells and whistles in the world but, its really not that special. (Of course, I say this now, with the rose colored glasses of pregnancy hormones no longer surging through my body.) This is all to say, the cravings have subsided. A few weekends ago, I decided to revisit a recipe from my childhood - syrniki. In Russian, they roughly translate to "cheese cakes". The traditional syrniki are made with a variant of cottage cheese called tvorog. It's a bit tangier and if anything, a form of quark. Unfortunately, tvorog isn't readily available in Clinton Hill and the only place to really get it is at an Eastern European speciality store or by traveling to Brighton Beach. The former isn't in my neighborhood and the latter is too far a trip. When you have a three month old flopping around on a play mat, taking a 45 min trip for a special kind of cheese just doesn't happen. So, as always, I improvised. Truth be told, I had a tub of cottage cheese which was about to expire so I used that in place of tvorog. What came out is as close to the traditional syrnik as I've had in ages and a great alternative to the pancake. The syrnik is lighter and smaller in size and it holds up as a leftover. (Have you had leftover pancakes? Unless you're hungover, they're disgusting.) Syrniki can be served with fruit preserves or even sour cream. I prefer mine drizzled with a little honey and spatter of powdered sugar, strong black coffee on the side. 1/2 cup for the dough, 1/2 cup for dredging. 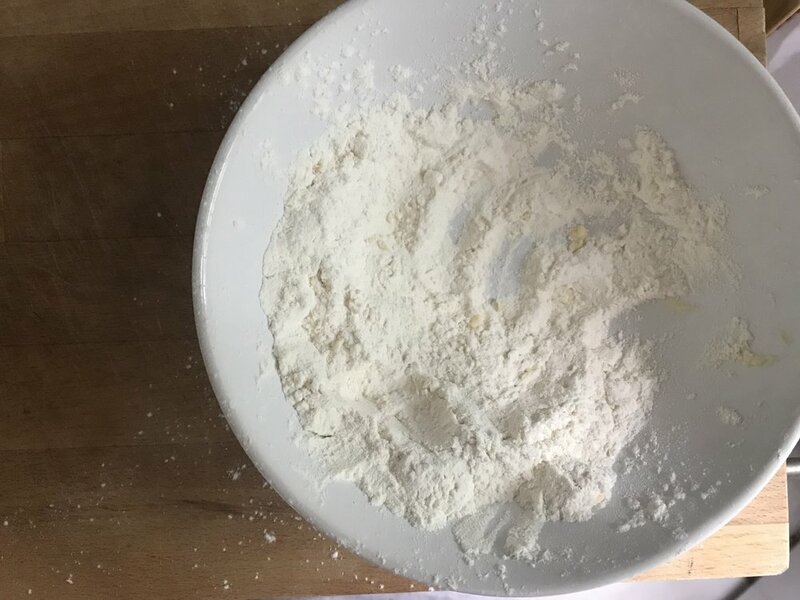 Fold in flour and raisins until well mixed. Heat a non-stick or cast iron skillet on the stove and pour in a glug of veg oil. Use your hands to form small patties with the dough. It will be very sticky! 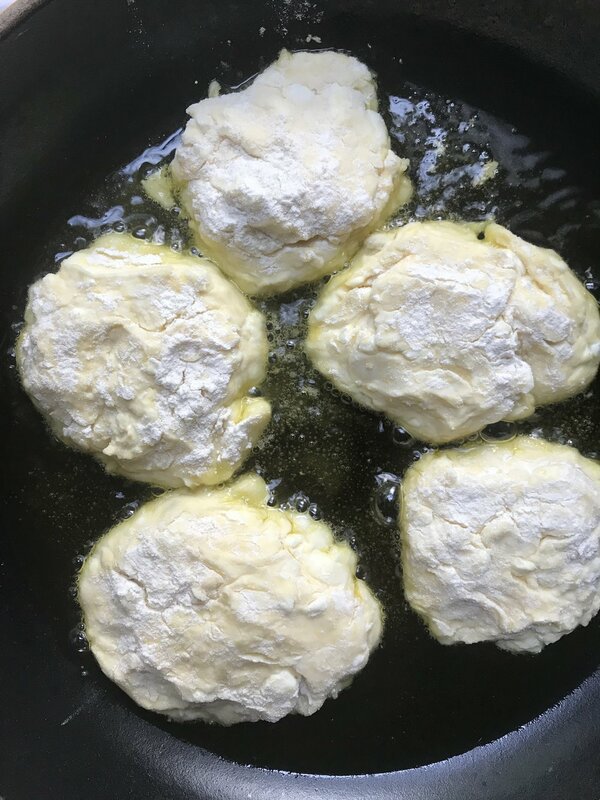 Dredge each patty in flour and place on the skillet. Cook each syrnik for 1-2 min. until golden, then flip until the other side is golden. Repeat the above step 1 or 2 more times until your cakes have an outer crust that's a darker golden brown. Keep adding veg oil to the pan and cooking the syrniki until you've prepared all of the dough. Serve hot for breakfast with a drizzle of honey and powdered sugar. Can also be eaten with fruit preserves and some fresh berries on the side! The leftovers can be kept in a sealed container in the fridge for up to 3 days.